May Festival Chorus, Cincinnati Symphony Orchestra/James Conlon. Do you keep a list of deserving master-works that have not yet been recorded? Narrow it down: what about a list of vocal-orchestral works awaiting their first ever recording on CD? Here are some extracts from mine: Maurice Jacobson's The Hound of Heaven, Cecil Effinger's St Paul, Granville Bantock's The Great God Pan, Joseph Holbrooke's Poe-based Choral Symphony, Queen Mab and Apollo and the Seaman, William Alwyn's The Marriage of Heaven and Hell, Eugene Goossens' The Apocalypse (I know it was issued by ABC on LP and audio-cassette but it has never made it to CD), Alan Bush's Piano Concerto (with choral finale) and Symphony No. 3 Byron. These are all expensive and in some cases perhaps chancy propositions. I confess that several I know of by repute rather than experience; mind you that's the way many of us start and progress as we pick up knowledge of the repertoire. Until the present Bridge CD came along Robert Nathaniel Dett's The Ordering of Moses was close to the head of my want-list. The label already has a reputation for thoroughness, valour and inspiration. Its contemporary music series encompasses Mamlok, Carter, Machover, Crumb, Rands, Ung, Chihara, Ruders, Wolpe, Feldman, Cage, Lerdahl, Wernick, Davidovsky and Perle. Bridge also looks back from time to time at distinguished and inspired figures from earlier American generations such as Edward Burlingame Hill (see JQ's recent review). Bridge's revival of a selection of recordings made for the Society for the Promotion of the American Musical Heritage in the 1960s by conductor Karl Krueger produced some excellent CDs (review review review). Dett fits well with these other discs. Who was Dett? Born in the same year as Grainger, Kodály, Malipiero, Stravinsky, Ponce and Turina he was educated at Oberlin Conservatory, Ohio and secured his B.Mus. in 1908, majoring in composition and piano. He pursued supplementary studies with Arthur Foote. His chosen livelihood was as a composer, pianist and choral conductor; the latter at churches and then as choir director at the Hampton Institute in Virginia and Bennett College in North Carolina. As a composer Dett drew inspiration from Dvořák who was a proponent of using the music of the Americas as source material for American composers. Dett also looked to another man who was influenced by Dvořák, Samuel Coleridge-Taylor who made several visits to the United States. Dett was born in Ontario near Niagara Falls but his career was made in the nearby USA. His first published work (1900) was the Joplin-influenced After the Cakewalk (1900). Soon a Magnolia Suite for piano followed. The influence of the spiritual began to surface in his choral works and in the early 1920s The Chariot Jubilee for tenor, chorus and orchestra appeared. Percy Grainger, a sympathetic soul, recorded Dett's Juba from the suite In the Bottoms. Dett had a spell at the Eastman School in 1931 and there studied with Howard Hanson. This lead to a full-scale oratorio entitled The Ordering of Moses (1932) which was premiered in 1937 at the Cincinnati May Festival with Eugene Goossens at the helm. It's fitting that the present recording with its innate sense of occasion is a Cincinnati affair with the May Festival Chorus and today's Cincinnati orchestra. Dett died of a heart attack six years later but with The Ordering of Moses at the head of the composer's catalogue you might perhaps have thought that there would have been further performances. There were only a scattered handful in other major U.S. cities. It seems that the work was revived for Cincinnati's May Festival in 1956 with none other than Leontyne Price as a featured soloist. As far as I know it never progressed beyond North America. I doubt there has been a London or Three Choirs performance but I would be happy to be proved wrong. Of inspired quality, time after time it proves itself affectionately memorable and fully merits more performances. How about the BBC Proms? A few other Dett works have haunted the record catalogue; try a search of this site. Beyond that there's one CD and one LP to remember. The CD is New World's recording by the illustrious Denver Oldham in a piano music survey (80367). It includes the Magnolia Suite, the Dance - Juba and the Eight Bible Vignettes. The LP never made it to CD. It was issued as one of a pair of Philips albums devoted to American solo piano music and played by Clive Lythgoe; Lythgoe's other album was of Macdowell (9500 095). Dett's In the Bottoms was coupled with Griffes' piano sonata on 9500 096. If you dig deeper still you may unearth references to two very rare vinyl LPs of The Ordering of Moses. The first was from 1968: Silver Crest TAL-42868-S (Talladega College Choir, Mobile Symphony Orchestra/William L. Dawson) and the world premiere performance of the oratorio from 1937 issued in 1972 by Unique Opera Records on UORC 113. The fiery Goossens was captured on lacquer discs from the Voice of America continent-wide broadcast on 7 May 1937 as part of the Cincinnati May Music Festival. I have not checked how much is missing but the relay, as broadcast, was crassly interrupted by a Firestone commercial. As you may have guessed from Dett's dates and his 'credentials' the music of The Ordering of Moses is straight-talking, tonal and melodic. The orchestral prelude (tr.1) is warmly brooding, coaxingly serious - a healing slow crescendo with harp and solo cello taking eminent roles. The cello returns again and again throughout the work - a magisterially recurrent hieratic voice. It is as if the composer intended the instrument to voice a role which in other cases he allocated among the choir and the solo singers. There are soulful solos from The Word (Donnie Ray Albert - tr.2) and from The Voice of Israel (Ronnita Nicole Miller - tr.3). God Looked Down on Israel (tr. 4) has a lovely rocking motif deep in the bass and baritone registers of the strings and there are fiery outbursts and blazing tone from the 140-strong choir. And from a burning bush is brilliantly orchestrated to suggest the bush afire and before one can draw breath the choir sweep in with stunning affirmation in an inventive setting of Go Down Moses. It's a spiritual that threads its way throughout the work in fragments or fully stated. It's an aureate dramatic sound (2:00) culminating in an ictus of protest from the orchestra and curve into the eloquent cello solo. Moses, sung by the resonant voiced Rodrick Dixon has a wonderfully passionate declamation which rasps with emotion. Dett's sound and treatment brings Delius to mind at times but then again the attack recalls Walton (Belshazzar written at about the same time) and RVW's Dona Nobis Pacem. Conlon's utter confidence in the work shines through; no holds are barred. This is not an apologia. The violent storm in Who hath made a man dumb? (tr 7) is nicely built and is equally neatly terraced away to silence. This leads into the central orchestral interlude. This groans with echoes of meditative and there's a Puccinian explosion at 3:00 before which we hear a grand trumpet solo and a dark Go Down motto tragic and deep on brass at 3:10. In the jaunty And When Moses Smote the Water (tr. 9) we hear an accelerating flood of music. The choral singing is possessed. The March of the Israelites (tr. 10)) is all easy-going healing undulation. It is a honeyed Delian cousin to Havergal Brian's striding trekking melody in The Gothic. The disastrous fate of the pursuing Egyptians is cinematically but briefly described. And when they reached the other shore ends with the choir's hallelujah's, the interweaving of tambourine and solo cello. In Sing ye to Jehovah (tr. 14) choir and orchestra crash and romp before the solo voice implores 'Sing Ye' and the response of the massed choir comes in tr. 15 He is King of Kings. This is a paean to the Lord complete with clacking castanets and a distinctly Eastern exotic accent in the orchestra; a touch of Bantock's Omar. After some single line solos for Miriam and Moses there is an explosion of very American 20th century energy to close things. This is a live performance but I did not notice any audience noise until the furious storm of applause at the end of tr. 15. By the way you can read more about Dett in Follow me: the life and music of R. Nathaniel Dett by Anne Key Simpson (Scarecrow Press, 1993). The recording is in 15 tracks so you will have no trouble finding your way around and even replaying favourite sections. The sound is very good. It captures details (castanets, trumpet, harp and cello) and also opening up gloriously for the moments of grandiloquence. 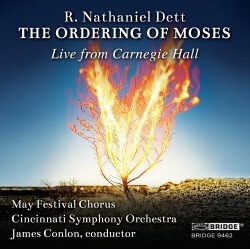 If there are further recordings of Dett's The Ordering of Moses we can hope that they arrive complete with the work's predecessor, the 23 minute Chariot Jubilee for tenor, chorus and orchestra. I know of it from a dim and distant tape of a version with organ rather than orchestra and it sounds very promising. The liner-note is in English only and is by Richard E Rodda. The sung words are also reproduced although some of those sung in tr. 12 seem not to be included. There are the usual artist profiles. Everything is laid out with agreeable clarity. It's a shame that the words are not related to the track numbers; minor stuff. Even so this is a very readable experience and ideally complements the first recording on CD of this superb work.